We catch up with professional travelling chef Dave Prior to discuss life in Australia, his adventures so far and how travelling has impacted what he dishes up for his international clientele. Hi, my name is Dave Prior, I'm an English chef now living and working in Melbourne, Australia. I enjoy travel and learning from other cultures and cuisines, and applying them to my classical culinary training. You are currently based in Melbourne, said to be the food capital of Australia, what drew you there and what is your experience so far? Five years ago I spent a year travelling and working around Australia with my girlfriend Lou. Ending up in Melbourne that year was always the plan, to be a natural end to the trip, it also just happened to be our favourite city we had visited in Australia. We’d always planned to come back for another year, which is what brought us here in 2016, but we keep extending our stay, and now we’re on the way to becoming permanent residents. When did you discover your passion for food? Food has always been an important part of growing up in my house, although there aren't any other chefs in my family. When I was quite young, maybe eight or nine, I used to make cocktails. I had cocktail recipe books, shakers, measures, syrup infusions but being so young I couldn't drink them! I soon took an interest in cooking, and starting writing to a chef called Anthony Worrall Thompson who gave me some advice on how I could become a professional chef - I took his advice to study at Westminster Kingsway College in London for three years. At 16 years old I couldn't have asked for better training, they taught me a mentality and disciplined approach to cooking, not just how to cook. Do you like to dine out or would you prefer to create your own masterpieces in the kitchen? To be honest I enjoy both equally, I cook almost everyday at home, I enjoy visiting the markets in Melbourne and seeing what’s good quality and what’s in season, then deciding what to cook afterwards. A few years ago we lived in Yorkshire, and together with Lou we ran a pop up restaurant called ‘The Crab Apple Tree’ in our home once a month. So I suppose that was the perfect compromise to dining out and cooking at home. We sold our sofa and gave away our TV, and converted the lounge into a dining space. We used to upload a menu via Twitter, then all sorts of different people would book a table and come on the night, it was a great way for people to socialise, eat and drink together. I was young back then, but I tried my best to serve honest, seasonal food for the guests at an affordable price. Once a 90 year old widow came on her own, she had taken 2 trains and a taxi. It was great fun and I'd love to do it again. We are spoilt for choice in Melbourne with dining options, the cafes and restaurants are of a high standard. The food scene in Melbourne is very much alive, it's an exciting place to be. Together with your girlfriend, you also have your own travel blog 'Two Hungry Brits'! Along with food, how important is travelling to you? Originally the blog was written so we could keep our friends and family up to date with our movements, and also let them know we were ok. It became like a virtual diary with Lou's photography to accompany the posts, looking back it's like a souvenir of each trip, I didn't realise the importance of travel until quite late into my career, like many chefs you can be a bit one track minded and closed off to the world in a kitchen. Travel is important as it gives us inspiration and a goal to work towards - it’s the reward to get out there and experience new cuisines and cultures. In what ways does travelling impact on your cooking? Travel has opened my eyes to new techniques, cultures, and an attitude I didn't have before. I can't put my finger on it, but I was naive to travel before and thought it was for hippies. Last year we spent 3 months in Mexico travelling through the different regions and learning about the culture and cuisine. As well as taking some much needed time off, I managed to organise some work placements. 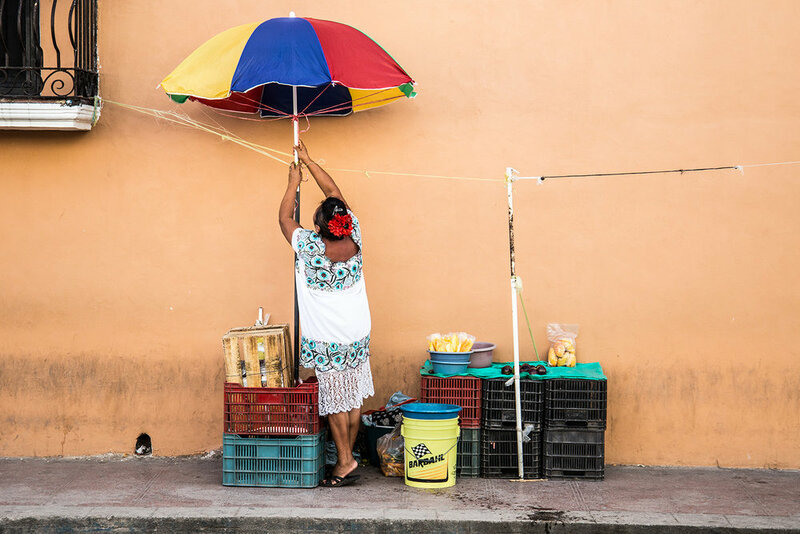 One kitchen in the Yucatan region, known as a 'cocina economica' was run by ladies cooking traditional cuisine all on open fire for the local community. It was the hottest kitchen I’ve ever stepped foot in, but watching and helping them cook I learnt some techniques and approaches to cooking I never had before. Hat’s off to those women who do that every day! At the other end of the scale, I was lucky to spend some time at restaurant Quintonil in Mexico City. It’s a fine dining venue, and recognised globally so I was very lucky to have the opportunity. The kitchen team were brilliant, so eager to teach me about their cuisine and techniques such as cooking various molés and working with unique produce indigenous to Mexico, some of which I couldn't pronounce at the time like the ‘xoconostle’ fruit. I was also lucky enough to try the famous escamoles, which are hand harvested ant eggs, some people call them ‘Mexican caviar’. Jorge Vallejo, the chef owner and his team, are really putting real Mexican cuisine on the map. Lots of brits fall victim to the beauty of Australia and end up staying forever! Are your plans to carry on travelling? I love travel, and hope that it will always be a part of our lives. We are a lucky generation that it has been made so accessible for us. We are ready to make a home here in Melbourne, but we still have a strong desire to keep exploring new places. Next on our list is Japan..